The property was beautiful, the rooms were huge and the pool and all of the decks were incredible. We absolutley loved it. Sergio also was wonderful and helped us with all of our arrangements- he couldn't have been any nicer and we highly recommend this property and would love to go back! I booked this extremely beautiful and spaces villa. As I needed a large rental to accommodate 10 people, as my step-daughter was getting married in Italy. The villa comfortably hosted the Wedding BBQ for 20 guest's and the "Feeling Italy " team very kindly organised a beer machine which was a nice touch. The Wedding guest were blown away by the stunning ocean views and could not get over how big the Villa was. The large infinity swimming pool was the talk of the party and was so much fun! The villa was extremely clean and well presented. The Property Manger was only a phone call away if we needed him and was very polite and helpful. Thank you for letting us stay in this wonderful Villa. We will never forget it! We think that Feeling Italy is a wonderful, professional, and thourough agency. Piero patiently and kindly spent hours talking to us and giving us advice- even before we booked the villa through them. Villa Chez Pie was gorgeous, comfortable and very accurate to the images and description on the site. Everything we needed was there, and as we were staying over Christmas, Piero even set up a tree and a few other decorations for us to enjoy. We thought we might want to try our hand at the local cuisine and found Carmine through Feeling Italy. Carmine was a wonderful teacher, and an excellent chef. He was organized and relaxed, but on task the whole time. The experience included every detail- from music, to special ingredients-like a ricotta you can only get by visiting the factory, to local wines, and a touch of Carmine’s private reserve fig jam made from his own garden. He even offered to have someone come in and clean up afterward! The meal was wonderful and authentic and we left with an arsenal of new recipes to impress our dinner guests. Cooking with Carmine is a must do- I promise you’ll enjoy the whole experience and end the night happy and full. Throughout our stay Piero was helpful with recommendations and checked in on us to see that everything was going well. From start to finish every detail was coordinated, transactions were relaxed and easy. 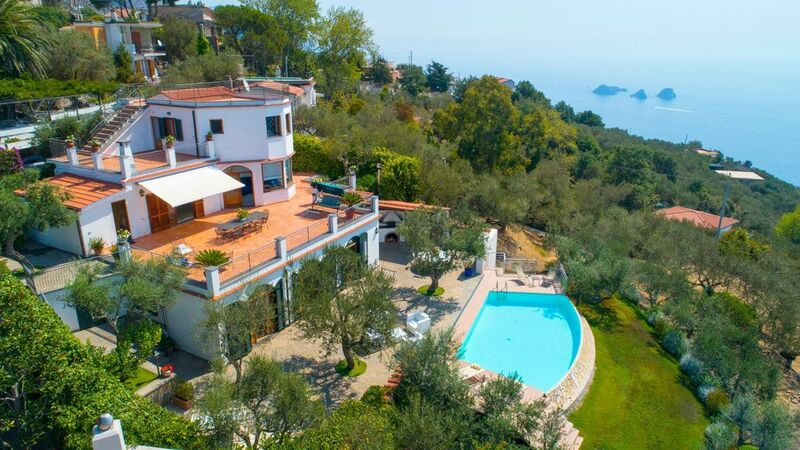 We would definitely recommend booking through Feeling Italy, especially Villa Chez Pie. Awesome property and host in Amalfi! We stayed at this wonderful property in the amalfi coast (hosted by Piero). This is a stunning property right on the coast with a wonderful view and a very serene environment. The property was very clean, Piero is a wonderful host and the property is located in an area not frequented by tourists. So you can enjoy the drive along the coast and come back to peaceful evenings! Loved everything about our stay here and highly recommend this property! By the way, there is also a michelin rated restaurant nearby - Don Alfonso 1890 and if you are in a mood to indulge - plan for a few hours - this is well worth it! Gorgeous villa! Best management ever! We were 2 families of 4 and 3. We rented this beautiful villa for tall 7 of us and it was more than we needed! It can fit easily a lot more people. The villa itself is just superb! The views are beyond description! Everything you see on the pictures is really there and looks even better in real life. Piero and Sergio were great! If we needed anything (and there was not really much you can ask for as everything is there – we asked for extra paper towels and toilet paper, I think), we called the office – Sergio was at the villa in 5 minutes with whatever we needed. This was a fairy tale! Mediterranean land that has been depicted described and immortalised in song by artists, poets and travellers from every period of history. Whereas inland, the high plains, rolling hills and lofty mountains are seared by deep valleys to create a truly unique landscape in which man has also left a clear sign of his remarkable work: the more impervious areas have been modelled into the now-famous terraces, those huge steps descending into the sea on which man gas planted vin yards and groves of orange, lemon and olive trees. Exclusive of local charges Fixed Costs: Breakage deposit in cash (returned): Euro 200. From 1 April to 31 October the Municipal Council of Massa Lubrense has instituted a mandatory tourist tax on all temporary residents. The tourist tax must be added to the total amount of stay and has to be pay cash at the arrival. The fee is 1.50 euros per person per night, and only applies to adults and up to 7 nights. Please note, there will be a final cleaning charge of € 200 added to the rental period at time of the booking.